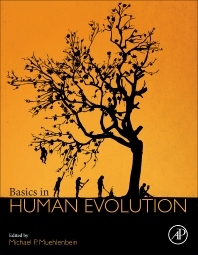 Basics in Human Evolution offers a broad view of evolutionary biology and medicine. The book is written for a non-expert audience, providing accessible and convenient content that will appeal to numerous readers across the interdisciplinary field. From evolutionary theory, to cultural evolution, this book fills gaps in the readers’ knowledge from various backgrounds and introduces them to thought leaders in human evolution research. Primates on an Ascending Scale? When Did Bipedalism Evolve, and What Evolutionary Stages of Bipedalism Did We Pass Through? What Selection Pressures Give Rise to Mating Systems? The Human Case: Do Males Possess Adaptations for Care? Extra-Pair Paternity: Sexual or Social Monogamy? Michael P. Muehlenbein is a Professor of Anthropology at the University of Texas at San Antonio. He earned an MsPH in both Tropical Medicine and Biostatistics from Tulane University, and an MPhil and PhD in Biological Anthropology from Yale University. He is a distinguished and prolific author and his research includes a number of different topics, from evolutionary endocrinology and ecological immunology to conservation medicine. He is currently working on understanding life history trade-offs between the immune and reproductive systems in primates, as well as risks of emerging infectious diseases associated with contact between humans and wild primate populations.